A few weeks ago I wrote a post title “Complex Systems Pedagogy and the school library” and presented this approach to librarianship at the #ISHCMCE3 conference. One of the challenges of examining our practice through the lens of complex systems is that it is an abstract concept that is descriptive rather than prescriptive in nature. As a result, while it can bring a fresh perspective it can also be difficult to understand the practical implications of a complex systems mindset. This post was inspired by my first day back from the #ISHCMC3E conference when many aspects of the practical outworking of a complex systems approach were apparent in various ways. This is far from a comprehensive view of library practice from a complex systems perspective but it does serve to illustrate a few key features of how the daily running of our library that are inspired by a complex systems pedagogy. 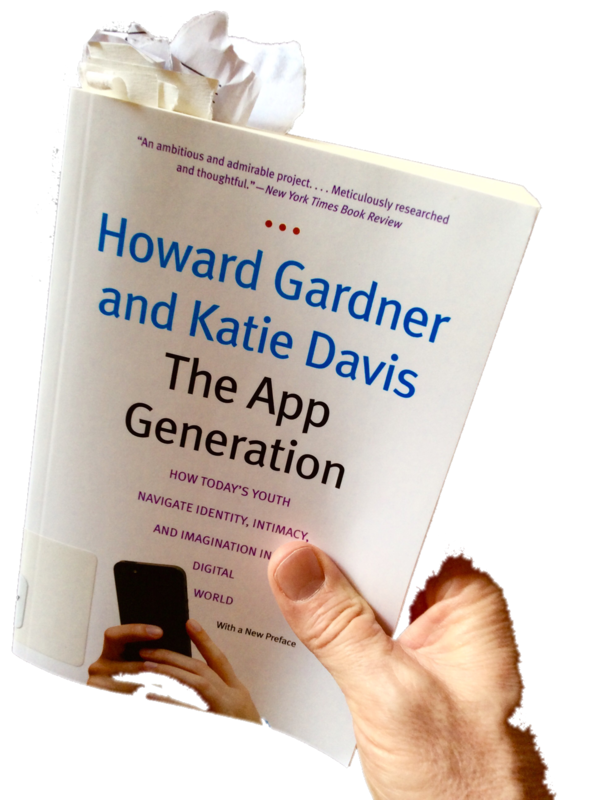 The App Generation : How today’s youth navigate identity, intimacy and imagination in a digital world by Howard Garner & Katie Davis, 2014 (complete with all my bookmarks). We can always be assured that when we pick up a book by Professor Howard Gardner, we are holding some very carefully considered and powerful ideas in our hands. I am not familiar with the work of Professor Katie Davis however after reading this book, I will certainly following her research in the future. Visit the book website [here] for a summary & video from the authors. Although not directly mentioned, his book approaches participatory culture and connectivist theory through the lens of “app-dependence” versus “app-enablement”. These ideas are expanded upon by considering three areas of adolescent life: identity, intimacy, and imagination. From the outset, this book sets a high standard for academic writing. The scope of the subject is clearly defined & methodologies set out in detail. The appendices further expand the transparency of the research behind this work which leads me onto a first general observation. The research draws heavily on the American cultural context which places significant limitations on how far findings can be extrapolated to other cultural & geographical contexts. Don’t get me wrong, the questions asked within the theoretical constructs the authors use to frame their discussion are extremely important & certainly caused me to think deeply about the “App generation” in my context. Suffice it to say that the cultural backgrounds, historical & technological contexts that the students I see everyday at an international school in remote South East Asia could not be more different from the subjects of the studies based in Harvard. There are most definitely commonalities but the temptation to extrapolate the research presented in this book to students outside these studies must be vigorously resisted. For example, the technological history outlined on page 52 is distinctly western (if not American) & most certainly not paralleled by the vast majority of the world’s population particularly here in Asia. How the students I see each day have come to this technological space is so diverse that we must guard most ardently against assuming we understand their perspective. I would go even further in saying that we can draw little value from describing a “generation” in any way for fear of drawing conclusions based on stereotypes rather than the lived experience of each individual student we encounter. This may sound like I oppose the premise of this book but not so. Instead, we should apply the same inquiring mind that Gardner and Davis have applied in their context to challenge our own assumptions about the “App Generation” present in our classrooms. Their rigorous & deeply reflective approach that seeks to draw information from multiple sources to make sense of a notoriously enigmatic topic such as technology & youth is refreshing in a field such as education which is rife with myths, unchallenged assumptions & scant methodology. In this short post I would like to pose a brief musing about the role of books in the learning environment. The idea stems from two other ideas, namely, the book as a physical artefact and the use of manipulatives in the classroom such as during investigations into mathematics concepts. There are a plethora of math manipulatives designed to allow students to grasp a new mathematical concept by holding it in their hands, examining it from different angles in a hands-on experiential way. Books, as physical objects, can similarly be considered as “concept manipulatives“. Apart from the rich stories, informational texts & all that books represent, the physical artefact that is a book gives students the opportunity to hold ideas in their hands. This is not a print versus digital argument either. It is simply an appreciation for the physical act of grasping a book or a pile of books on a subject & organising them, categorising them, classifying them, sorting them and all the while discussing & engaging with various concepts that may relate to that subject area. Even the act of searching the library shelves for a book engages the whole body in the process of research. Avoiding Plagiarism : What’s the big idea? Plagiarism is an issue of concern for every educational institution across the world. Plagiarism is a serious issue requiring serious attention, however, a more holistic approach is required to support sound pedagogical practices that avoid the use of punitive measures to enforce sound practices. A more refined approach to the issue of plagiarism will do less to strike fear into the hearts of students and more to support and enhance authentic inquiry. Addressing academic honesty with a more holistic approach therefore becomes an opportunity to further support student learning and the development of deeper understandings through proficiency in information literacy. and allow an audience to connect with their sources. Taking a step back from the plagiarism issue, one of the key ideas is to build student understanding of our place in the continuum of knowledge and the connections embedded within complex information systems. We are able to acquire knowledge through connecting to these information systems and make sense of that knowledge to construct new understandings. Through our own senses and reflections we are also our own source of information but we must also be mindful of the many factors that have influenced our thinking. Our current understandings are therefore a result of accumulated ideas, information and influences throughout human history that have a unique manifestation in each of us. Knowledge and understandings are therefore an emergent phenomenon that is at once passed on to us but also entirely uniquely synthesised by each individual to create meaning. Our own understandings are the result of the enumerable connections throughout our lives. While we construct new meanings throughout our lives, we are also constantly contributing in constructive and destructive ways to others who are connected to us. We are therefore part of a continuum and complex network of information, knowledge and the construction of meaning both individually and shared. Understanding this continuum and network of connections draws the antiplagiarism emphasis away from a rules based approach with punitive measures toward a deeper understanding of the fundamental role the sources to how we come to know what we know and the meanings we construct. Our ability to recognise those sources and the influence they have on our understandings is fundamental to our learning experience and how we communicate those experiences with others. This is the broader context that citation styles fit into. Citation styles should not be the primary focus of antiplagiarism measures. It is more than being principled. The process of pursuing meaning requires investigation and searching which can end in new discoveries and dead-ends. Documenting and celebrating this process with it’s successes and frustrations emphasises the process of inquiry. Connections to sources, both relevant and redundant, provide a key to understanding the process of inquiry. How do we know what we know? Where have our new understandings come from? Do these sources support our new understandings or has what we thought we knew been challenged? An idea might make perfect sense to us but did we develop that understanding from somewhere else? Was that idea drawn from a range of sources? Providing ourselves and our students with the time to dwell on an idea and to consider the role of various sources that contributed to the development of that idea is vital to allowing new understandings to emerge. New understandings can come from taking the time to dwell on new information and considering how it impacts our thinking processes. How that information came to us may alter our perceptions and determine the importance we place on that information. As we pass on our knowledge to others, discussing relevant sources enables those we communicate with to connect directly with that information and understand how we have formulated a unique synthesis of ideas. Discussing relevant and reduntant sources provides the listener with a deep framework for understanding the ideas we are communicating. Linking the audience to sources ensures they are adequately connected with the broader information system and knowledge continuum surrounding a topic of interest. Finding sources that challenge our thinking and lead us to new and more comprehensive understandings demonstrates an openness to ideas that may unsettle established patterns of thinking. Recognising the contribution of others to our own ideas reflects an empathy and respect for the part they have played in building collective understandings. Being prepared to risk sharing our own ideas, particularly if they are found to be incomplete and require refinement, is fundamental to learning. Permission to take these risks, explore a range of sources, opinions and approaches provides greater opportunities for authentic research and learning. If the focus is not on achieving “correct” answers, we are more prepared to risk being “wrong”. The result is less focus on the “right” answer, and permission to risk generating our own ideas. Fear of being incorrect and failing as a result, is a strong motivator for copying someone else’s well written work. A balanced research process incorporates sources of information that contradict each other and offer different perspectives. We then draw together this information to develop our own perspective demonstrating a deep engagement with the focus of the inquiry. Reflection allows us to connect relevant sources of information to what we know and identify sources that are incomplete or unsupported. Having time and support for us to consider how we know what we know provides us with this opportunity. An awareness of our self as a source may lead us to deeper inquiries that challenge or build our understandings. What can an holistic approach look like? Students and teachers using Creative Commons licensing for their own artwork. Transdisciplinary understandings: students making connections to sources across all disciplines demonstrates a deep understanding of how sources of information connect to what we know. Students and teachers discussing the role of specific sources in how they came to the new understandings they achieved. Using social media as a virtual referencing system to connect an audience with the sources of their information (eg. Twitter hyperlinks). 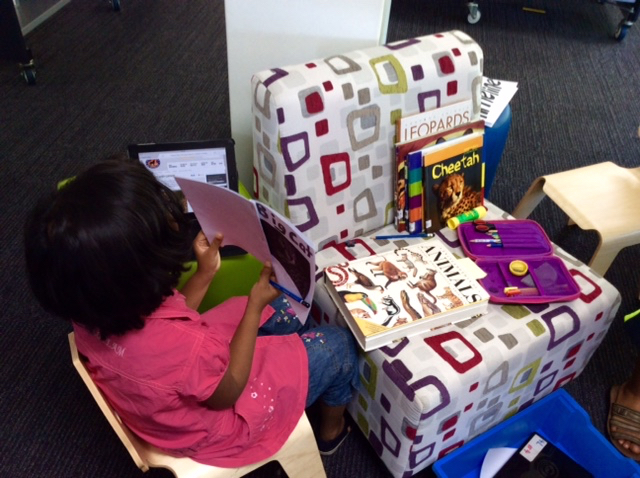 Displaying the books used during research at an exhibition (eg Personal Project, PYP Exhibition). Providing an audience with “if you would like to know more” links. Using the Process Journal during the Personal Project to record the frustrating sources of information that led no-where. Using fiction to illustrate new ideas and perspectives. Young students using picture books to help express their ideas. Academic citation methods applied consistently when writing the Extended Essay. Young students able to describe the Who, When and Where components of sources of their information. Students who are able to describe the significance of the Who, When and Where components of sources of their information. Students can identify when they need to stop an inquiry and describe research needs if that inquiry was restarted or taken on by someone else. The 6th Asia Pacific Conference on Academic Integrity occurred during Oct 2-4, 2013, Macquarie Univeristy, Sydney. “The Asia Pacific Forum on Educational Integrity (APFEI) is a multi-institutional, cross-disciplinary and non-profit organisation that fosters research and collaboration on issues relating to educational and academic integrity. Currently based in Australia, APFEI aims to provide a platform for the discussion, investigation and promotion of ethical research and writing practices.” [from the APFEI website]. Also available through APFEI is the International Journal of Educational Integrity IJEI published twice per year. “The journal challenges readers to consider the changing nature of education in a globalised environment, and the impact that conceptions of educational integrity have on issues of pedagogy, academic standards, intercultural understanding and equity.” [from the IJEI website]. Purdue Online Writing Lab is a place I frequently visit as a reference for citation guides however there is also a wide range of writing advice available here. Very comprehensive. Presents extensive but concise and clear information about plagiarism. Excellent resource. No need to re-invent the wheel with resources like this. It is important to note that Plagiarism.org is sponsored by iParadigms LLC, makers of Turnitin, WriteCheck, and iThenticate. International Association of Academic Integrity Conferences (IAAIC) is an alliance of key academic integrity and plagiarism conferences worldwide, formed to facilitate international conversations on educational issues ranging from cheating and plagiarism to pedagogy and best practices. The IAAIC currently has members from academic integrity bodies in the UK, US and Australia and supports research initiatives from practitioners and institutions throughout the global academic community. The perfect librarian: is it about focus? Sometimes a day in the life of a librarian is like sitting in a swivel chair with everyone else deciding which way you turn. The day swings from tranquil moments to inundations of inspirations that need attention. I guess I am my own worst enemy since being interruptible has been a key focus of what I am about. The day to day running of library is always interruptible ensuring that our customers never feel unsure about if it is ok to come into the library spaces or to ask for assistance. The message is subtle and often unsaid but if the library has an open door that welcomes any inquirer at anytime, the library is much more likely to be seen as an extension of the classroom and a natural part of the workflow of students and teachers. This means that many times, important administrative tasks in the library are interrupted and postponed due to a need to attend to a student, teacher or parent inquiry. Most of these important administration tasks will never be seen or appreciated by library visitors and since there are no other librarians at my school, there is really no one else who understands what it takes to keep a library ticking along. Indeed, the better I do my job, the less people are actually aware of what I do because their access to the “good stuff” is seamless. Yet, this is actually how I like it but this brings me back to the title of this post. The perfect librarian: is it about focus? Dianne McKenzie of Librarygrits.blogspot.com fame very kindly invited me to write a guest post on her site to help kickstart my own blog. I have also included the post below to complete the loop. I was recently lucky enough to attend a workshop lead by Dianne and her colleague Gary Green where I was inspired (and gently pressured by Dianne) to begin this blog to document some my thinking, frustrations and successes, to pose questions and engage in a wider conversation about the unique role of the library in the communities they are a part of. We can never underestimate the library element in our communities and never shy away from connecting to librarians across the world. So here is my guest post on librarygrits.blogspot.com. Thanks Dianne! >> Imagine creating the library you have always dreamt of. What is “The Library Element”? Welcome to new The Library Element blog. I have poured myself into renovating, developing, refining and honing our library here are Vientiane International School. After often being asked about the redevelopment process, I have decided to begin The Library Element to document and share the many details and facets about the what, the how and, most importantly, the why behind what we have done. Please feel free to contact me if you have any comments or questions about anything you read on The Library Element. So why “The Library Element”? The word “element” has multiple meanings in different contexts so it is suitably ambiguous for the purposes of considering the many different elements of the library. We can find ourselves in our element in the library. The library is a unique space not found in other physical or social structures in our community. Never understimate the significance of the library element in our communities. The connection between student achievement across all ages and a well resourced library with professional staff is unarguable. The correlation has been reinforced through numerous studies [ala; alsa; NY Comprehensive Center; IOE London]. We are not just talking about student achievement but also a personal and community sense of wellbeing is enhanced by the presence of a cultural centre such as the libary. Without the library element we begin to lose the very fabric of our community and society as a whole. The library is an element in our community that cannot be reduced to a simpler form. In fact the role of the library in the information age has only expanded [New literacies; IASL; ASLA Learning without frontiers] . The library is a primary constituent of our society. There is a reason why any despot, tyrant, marauder or dictatorship targets the destruction of the library as a means for control and the suppression of independent thought and free speech [Books on Fire]. Welcome to The Library Element. "The world is becoming more complex" - is it really? Pause and consider this. Roblox Studio: What about child safety? Library curriculum integration through a Complex Systems approach.